Yoga Camp was pitched on a gently swelling hillside with a view of Glastonbury Tor. First thing in the morning, as the sun came up, the hills across the glacial plain rose out of a sea of mist. Two thousand years before, the land around Glastonbury was marshy and prone to floods and the idea of a mystical “Lake of Avalon” is not too hard to imagine. It also meant that on clear nights in late August, it could get surprisingly cold and a cold night’s sleep goes straight to the bladder of the average middle-aged camper. So a trip to the squat toilets at two a.m. wasn’t an uncommon thing. 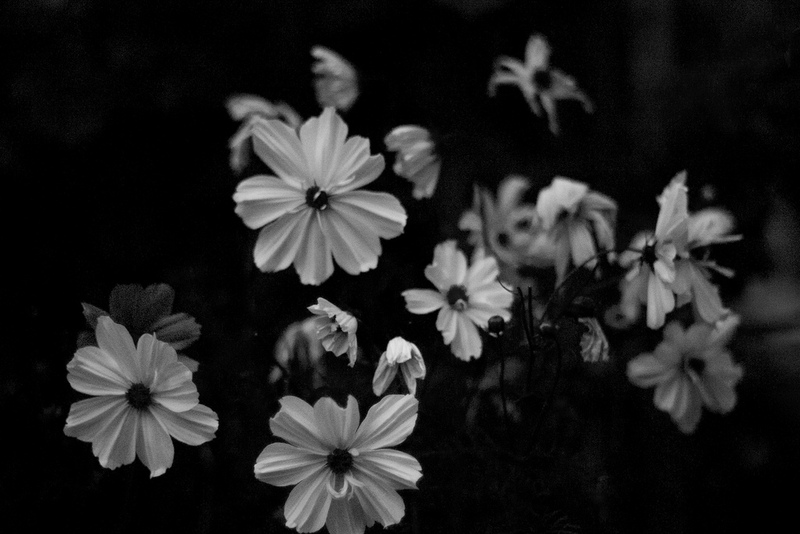 This particular night, I struggled out of the tent to find myself standing in a field full of silence and moonlight. You may think of silence as an absence of something but at certain times and in certain places, silence is like a full glass with the liquid swelling right on the edge of the rounded rim. I held my breath. The moonlight and starlight were bright enough to navigate the guy-ropes webbing the field. I made my way to the main path circling the tents and listened. Part of the world, that part of it made up of people zipped up in sleeping bags in tents and caravans, was sleeping. The rest of it was awake and listening to me. I walked through it, becoming aware of the fulness of it embracing me from all directions. It’s possible I said a prayer; not to any divinity in particular, though the sacred in various forms was walking all around me at that moment, but as a part of my immersion in the infinite interpenetrating of life with life that I suddenly found myself a part of. Sleeping humans, animals, trees, grass, earth, stone, water, wind – all held me and I was happy and grateful to be held. The challenge of experiences that can only be described as animist is to shift from the anthropocentric view of what it means to ‘experience’ the world, and to accept the fleeting nature of one’s own egocentric perception. At the sensory level, a tree perceives the world in an unimaginably complex and far-ranging way. Does the tree feel? Does the soil that the tree grows in? I think the tree and the soil do. Not as a human feels but if human feelings are made up of chemical trails, sensory inputs and neural connections, then a tree’s are hardly less valid and a good deal more durable. Perception, accepting the breadth of possibilities that perception stands for, is the important thing. Zen, yoga, various Christian traditions of quietism and the Sufis all look to a the idea of mindfulness, of letting oneself be situated in the world. In so doing we experience what it is to be a minded being, to be purely perceiving the world. It seems to me that Orr argues that the very stuff of nature is minded – that nature is mindedness and that this mindedness enables the network of perceptions that, at various levels of intensity and complexity, forms communities, tribes and, ultimately, individuals. Anyway, I’m putting it all very badly so you should just read her book. nd the night and seeing it as if for the first time. Perhaps it was a kind of initiation. It was certainly a blessing. For quite a while now, I’ve been trying to embed a teeny-weensy sense of the sacred in the life of our family. Whilst she’d probably put it differently, supermum feels the same way. It comes from a sense of unease that we don’t properly appreciate the things we’ve been given and how fortunate we’ve been in life compared to other families. On the other hand, I’m equally uneasy about the level of moral smugness and superiority that hovers just beyond any formal attempts to express ‘gratitude’. Also, I’m not talking about charity here. We have the direct debit with ‘Save The Children’, buy the Big Issue (which I feel guilty about not liking very much), recycle, sign petitions and go on the occasional protest march. I write to my MP about things that shock me and give money to beggars. All of this is perfectly Richard Dawkins friendly and doesn’t help. What I’m actually talking about is religion. Now I’ve always seen my parent’s brand of Catholicism as something horrible and oppressive but as I’ve got older, I’ve begun to appreciate the stable centre it gave to lives which would otherwise have been very uncentred indeed. But returning to the church isn’t an option. For one thing, I don’t believe in an ‘interventionist God’ (I quote that line from Nick Cave an awful lot). For another, I don’t accept the bigotry, paedophilia and regressive politics that seems to go with mainstream Christianity. And I’ve zero interest in hair-shirted Presbyterianism. Quakers offer a reasonably attractive form of Christianity but there’s still that barrier of being personally redeemed by Christ. No thank you. Islam suffers from most of the issues that Christianity is dogged by (see bigotry, regressive politics etc) and I really would need a complete cultural refit to deal with Hinduism. Meanwhile, full-on engagement with other religions that interest me has is complicated by the lack of any real scope for engaging with the family. Zen Buddhism isn’t really kid-focused and Richard and Linda Thomson have probably put me off Sufism for life. Also, supermum doesn’t do religion. It’s one of those blank spots in our relationship. Her family never had any religious involvement and she literally cannot comprehend an inner life as moulded by religion as mine has been. On the other hand, she gardens. She pays attention to the seasons. She wants to acknowledge that life is passing and things happen to us, good and bad. This, then, leads us towards paganism. Being me, I’ve thrown myself headlong into exploring Anglo-Saxon heathenry. As a family, we’ve been poking gently at Goddess strands of paganism and encountered Starhawk, Diane Baker’s and Anne Hill’s source book for children and goddess traditions, Circle Round, which has many wonderful things in it but a fair leavening of material which makes me cringe. I’ve also been reading the rather more critical Ronald Hutton whose book Triumph of the Moon respectfully but thoroughly debunks much of the ‘ancient’ tradition surrounding Wicca and its ideologies (which has made trying to find anything we can do relating to Easter a bit of of trial, given the lack of substantial historical provenance of the goddess Eostre). Now hang on a minute, you’re probably saying. If you’re so dead set against religion and don’t believe in God, how on earth can you so easily charge off into a world of irrational pantheism and animism? Fair point. I suppose it comes down to seeing engaging with the sacred as a creative act. I don’t need the divine to have a concrete, verifiable existence to invite it into my life. As a writer, I do this every day with things that I evidently make up. Examining or reconstructing or recreating older/extinct/modern traditions provides a means of carving a space for stepping outside our everyday place in the world and thinking about it. Making sense of it. Or making sense of the lack of sense. We’re born, we live and we die, and the year round cycle paganism explores offers a way of creatively engaging with the mystery at the heart of this. 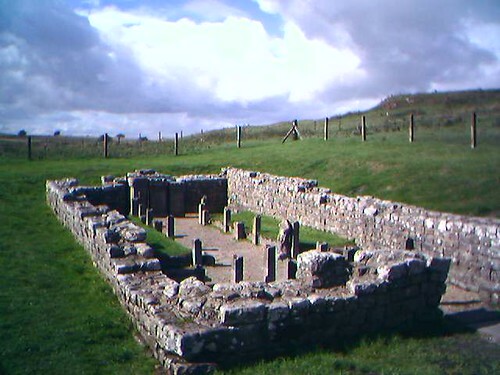 Early on the second full day of the walk across Hadrian’s Wall, I passed the Temple of Mithras near Carrawburgh fort. It’s now nothing but an outline of ruined walls and a cast of the surviving cult altar stone at the north end of the temple. A wire fence entered through a stile surrounds it and a sheep had managed to wriggle its way inside and get trapped. The sheep baaed and ran to the other end of the enclosure, keeping the temple between me and it. I ignored it. I stood in front of the altar and wondered about the men who’d worshipped here back in the third century. They would have been soldiers – Mithras was a soldier’s God – and far from home. 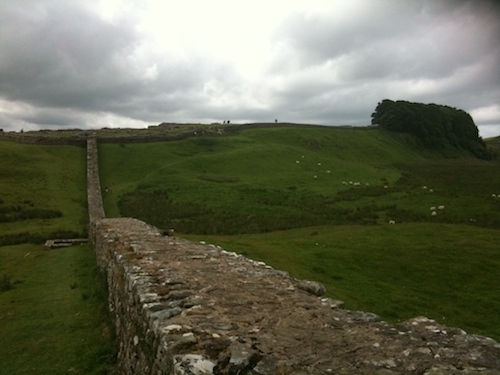 Hadrian’s Wall was mostly garrisoned by auxiliaries from other provinces such as Gaul or Frisia (now part of the present-day Netherlands) so the weather wouldn’t have been too much of a shock. But the land, even at this end of the Wall, would have been bleak enough in summer and relentlessly harsh in winter. The heat and smokiness of the small, crowded space (temples to Mithras were built as if underground without windows) would surely have been comforting compared to the bleak moorland surrounding the immediate settlement. Shot by nickbarlow and sourced on Flickr under CC. Cheers! As to the beliefs that comforted them, we simply don’t know. Early twentieth century theories that related Mithras to Iranian cults and centred on the idea of the slaying of a bull have been displaced by a more cosmic vision of a god who journeys through each constellation of the cosmos yet lives outside of the ultimate boundaries of the universe as set by the ancients – beyond the heavenly sphere where the stars and planets are set. Scholars, of course, differ as to the details. Rosemary Sutcliff’s marvellous Eagle of the Ninth evokes the force and meaning of the religion for a soldier quite convincingly. She clearly draws (she was writing in the 1950s) on what are now taken to be discredited ideas but the sheer beauty that religion can evoke in the most brutish of lives is wonderfully suggested. But beyond that, we don’t know. Mithras was a mystery religion and its mysteries died out unrecorded other than through the slurs of contemporary Christian writers or the observations of the likes of Plato and Plutarch. Eli and Jo, two other Hadrian’s Walk-ers, arrived at the temple and worried about the sheep. It was certainly unhappy but someone needed to keep the stile open to let it out and it was determined to keep well away from the worryingly eccentric looking humans besieging it. We gave up trying to persuade it. It was a wide enclosure with plenty of grass and a farmer would be along in due course. I stayed for a few minutes longer. Finally, I added a small coin to those left in a hollow in the altar. I bowed my head and clapped softly, Shinto style, in memory of what had been the tutelary spirit of the place and walked on. My knee was already hurting as I trudged away from the fort, over a stile and up the next hill (and there were a lot of hills, even at this point). Going down was worse. A little while later, Sherri and Steve lent me a handful of Ibuprofen. Walking next to the wall, looking along the length of the valum and the remains as they rose towards the real heights of the wall (tomorrow’s walk!) the sun came out. Simultaneously, the ache in my knee subsided in a gentle wave of glowing warmth. It was probably the Ibuprofen kicking in but it could have been a nod from an old god. It’s quite late. Dudelet (age 6) is finishing a rather improvised tea. Later, supermum came in and he told the story all over again. Then he announced that we had to have another three guesses and things got complicated. I never did find out who told him God made us but we have our suspicions.